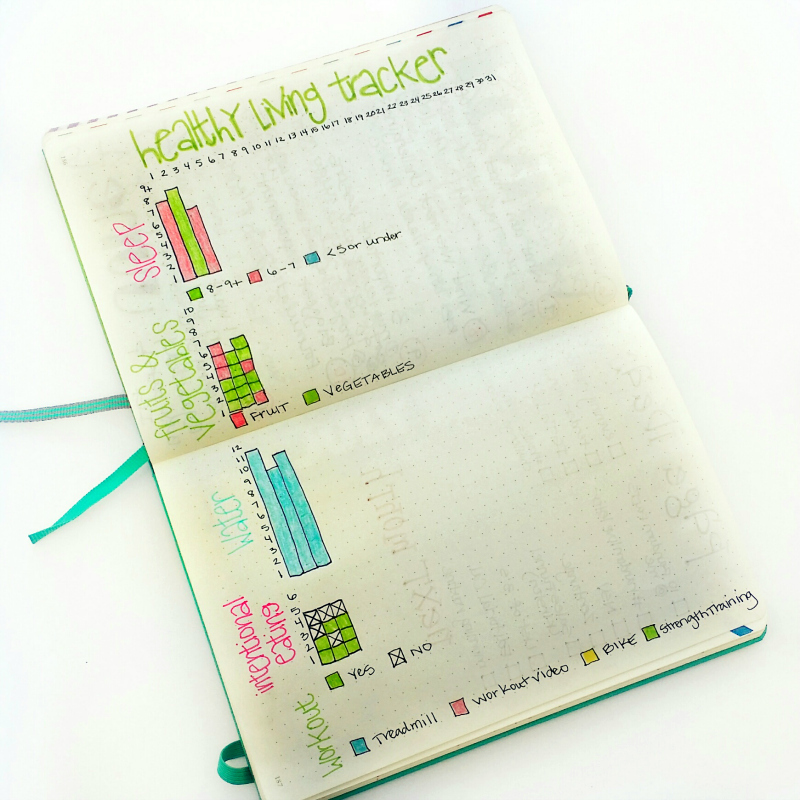 One of the most important things you’ll do on your journey to health and wellness is to track your fitness progress. Knowing you’re on the right track is essential for keeping motivation high. Unfortunately, the scale is not the best tool you can use, but it’s the one people most commonly rely on. In fact, the two best decisions I’ve made on my own wellness journey are weighing only once a month and not counting calories!! I’ve lost over 70 pounds and never had to count a single calorie, but that’s not the topic for today. If you LIKE to weigh-in daily and count calories, more power to you, but I know they don’t work for me. Figuring out what works for YOU is really the key to being successful in anything. And that’s precisely why I love bullet journaling!! Because it’s so flexible, you can make it be exactly what you need it to be. If something isn’t working, you can leave that page behind and try something new! So, that would be my first piece of advice: Don’t be afraid to experiment. If something isn’t working for you, stop it and try something else. 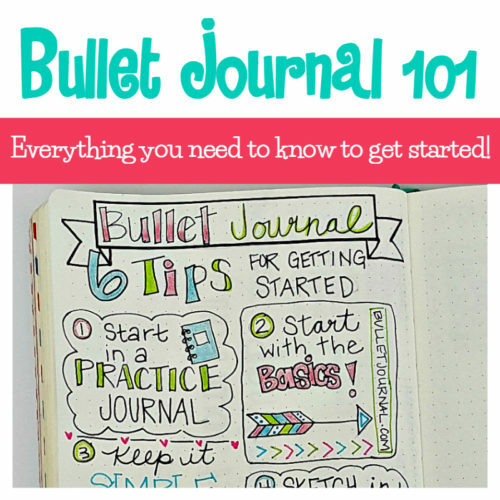 As I’m sure you’re well aware, the Bullet Journal community on Instagram and in Facebook groups is AH-MAZING!! I never lack for new ideas to try. In fact, I have a swipe file full of screenshots that are waiting for me to try them someday. Okay, on to the topic! I’ll start by sharing my very first health and fitness pages in my first Bullet Journal. 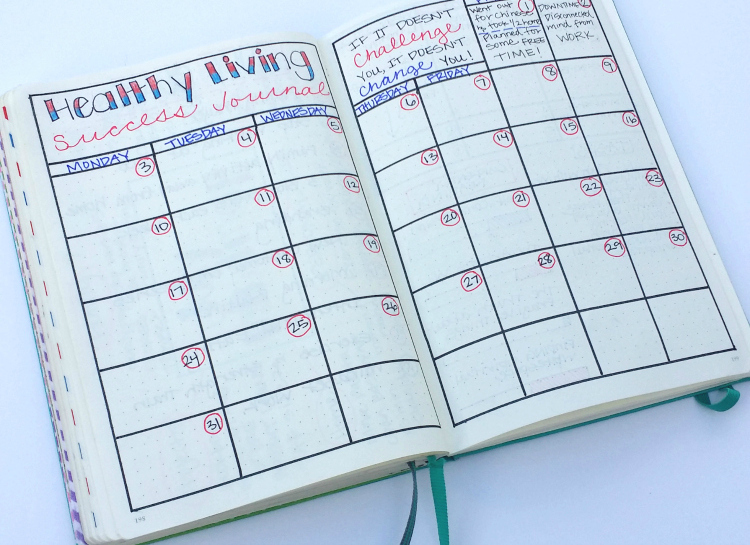 This layout includes a simple measurement progress tracker for writing down your measurements each month. Like I mentioned, the scale isn’t the most reliable tool for various reasons, so adding another tracking method can give you a boost when the scale isn’t cooperating! 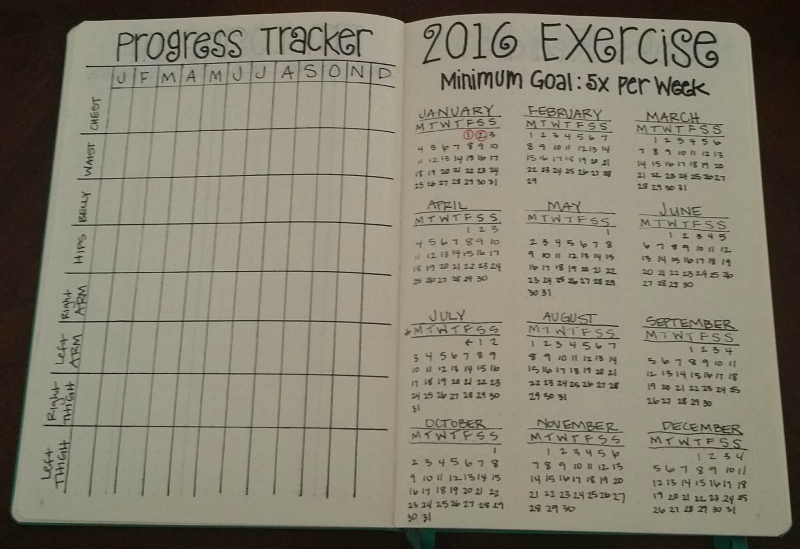 The 2016 Exercise page is a simple calendar where I circle every day that I workout. It’s pretty motivating to fill it up throughout the year and when you look back at all that work you put in, you can see that you have made a lot of progress. 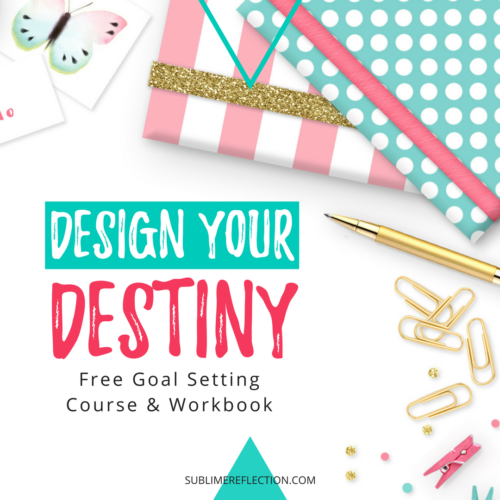 One of the tools I teach my health coaching clients is to redefine their definition of success. I don’t know about you, but I call it a success if I get 5 workouts in per week, no matter what that darn scale has to say about it. 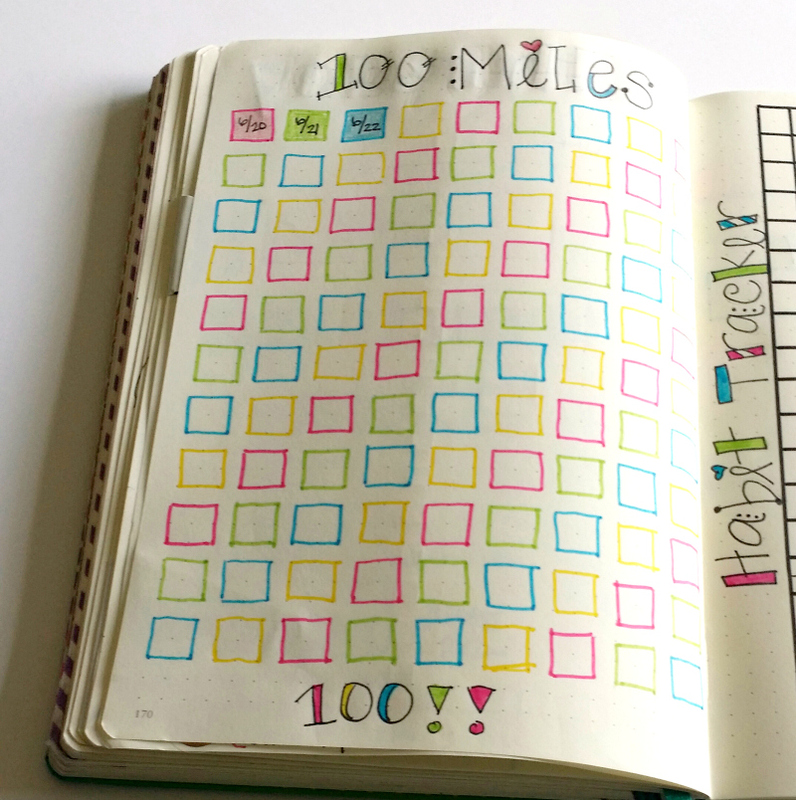 Here’s a fun way to track how many miles you walk or run. It’s amazing how motivating coloring in a little square can be! Strength training is an important part of any fitness routine. I divide my strength training days up by body part, so I created this spread to track what I’m doing. I listed the different exercises in the left column, then each day I train, I write down what weights I used. You’ll see a few that are circle in blue. That means it was a struggle for me to get through the final reps of the exercise. This is good information to have the next time you work that body part so you know what weights to start with, and so you can see the progress you’ve made. 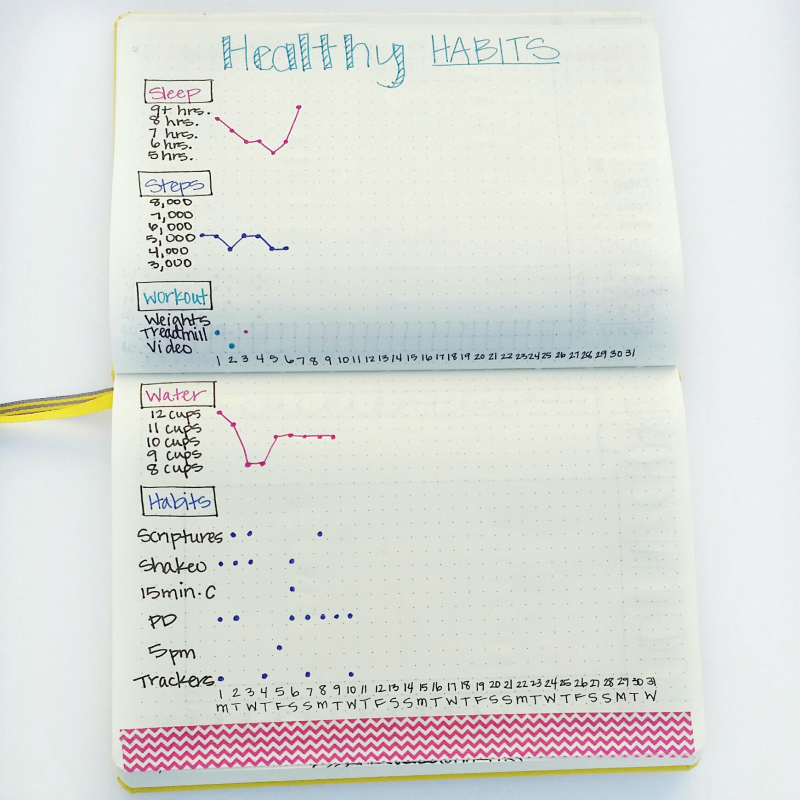 There are a lot of different ways you can track healthy habits. When implementing new habits, I’m a big fan of starting out so small that you can’t fail. 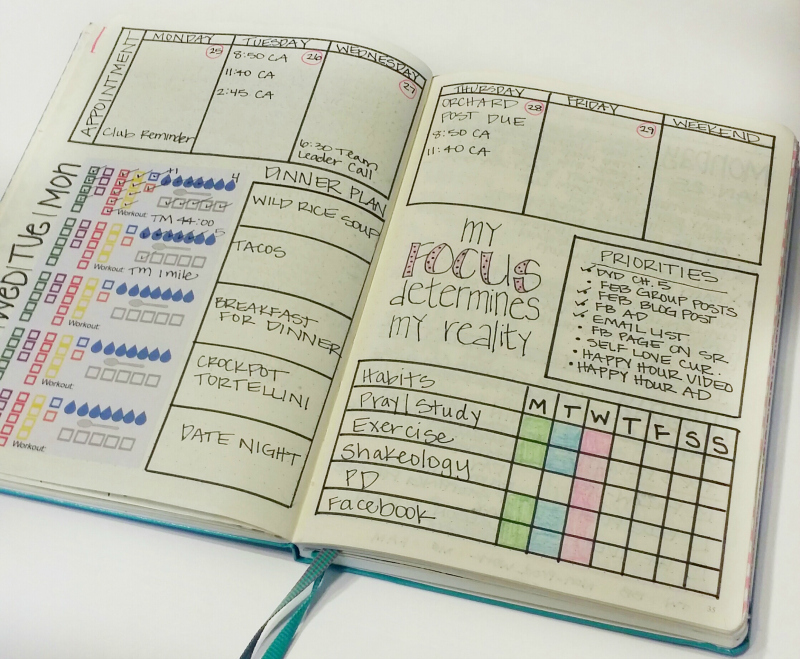 One way to track something like that in your Bullet Journal is to pick one habit to work on. Mark off each day that you complete your new habit. If you get through an entire week and don’t miss more than one day, add a second small habit the next week. If you don’t complete it at least 6 days, simply repeat that habit again the next week. 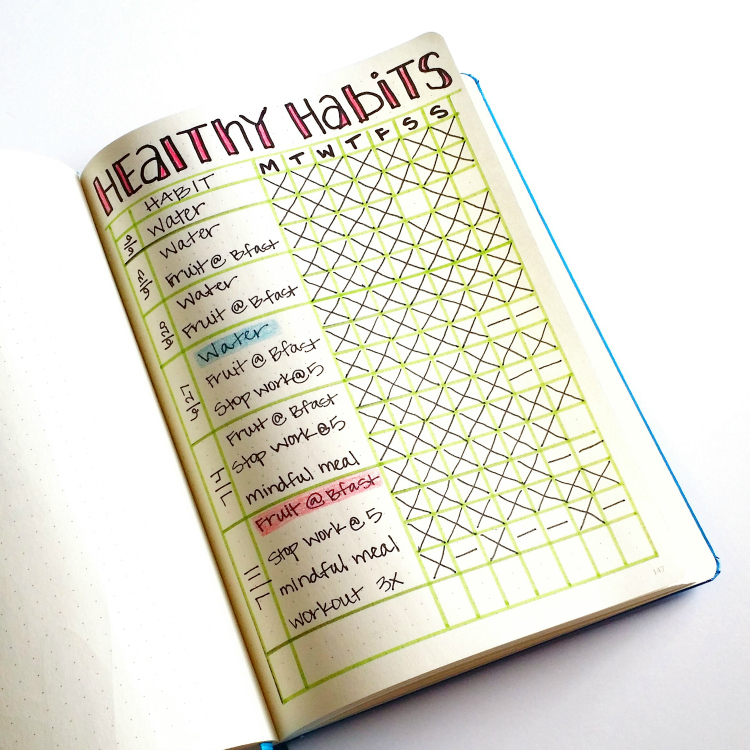 After you’ve completed a habit successfully 3 weeks in a row, you can drop that one off your tracker and add on something new. 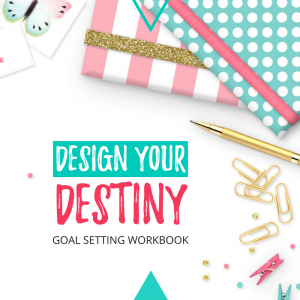 That way you’re never tracking more than 4 habits at a time. I highlight the habit after I’ve completed 3 weeks just as a reminder that it’s still something I want to be aware of and continue. It’s also an easy way to glance back through and see which habits you’ve completed and make sure you’re still doing them. This method was much easier to keep up with! This month I also included steps and added some of my other daily habits at the bottom. I went out to eat and boxed up half to take home. I put my fork down between bites and ate mindfully. I didn’t feel like working out, so committed to at least 5 minutes and ended up doing 20. I stopped work at 5 and focused on my family. I picked fruit for dessert. I planned some ME TIME! You get the idea. Focusing on what you’re doing right will motivate you to keep going and recognize that you really are making progress, even if it doesn’t feel like it sometimes. We can’t leave without talking about food, right? 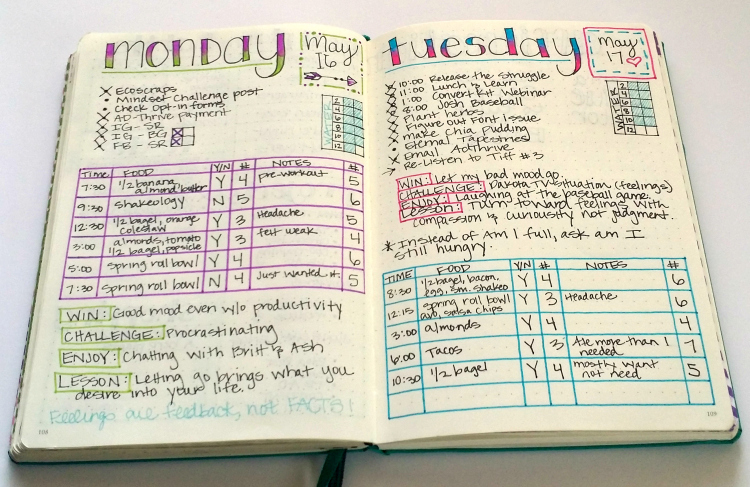 There’s scientific evidence to suggest that anything you track improves, so I strongly recommend keeping a food journal of some sort. I’ve used several different methods. When I’m following the 21 Day Fix nutrition plan, I usually just print labels to track so I don’t have to draw all those little squares. If you’re doing the FIX and want a copy, let me know what calorie level you’re on, and I’ll send you a file you can print on Avery Labels. 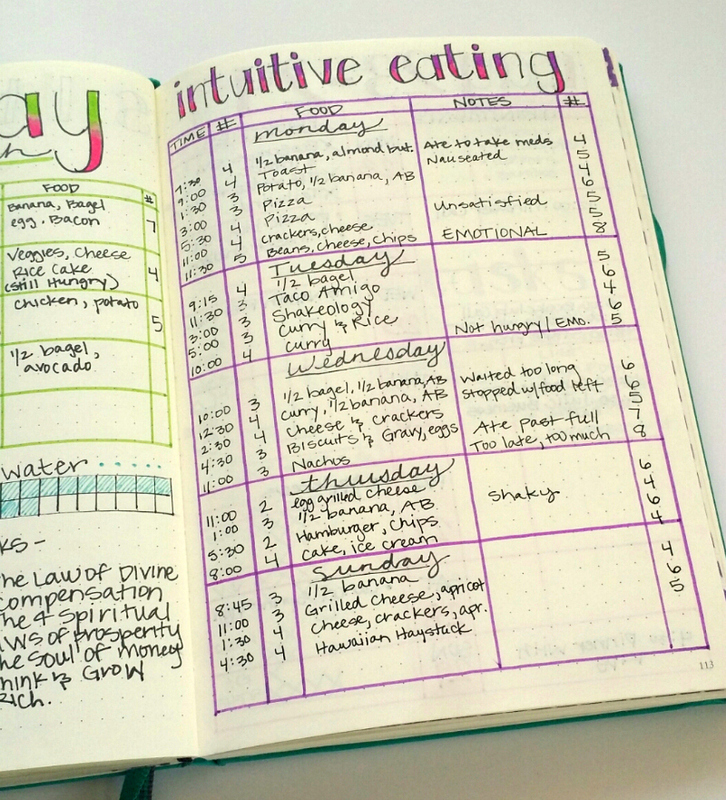 Recently I’ve been focusing on Intuitive Eating. If you want to learn more about it, I highly recommend the book Intuitive Eating by Evelyn Tribole. In the spreads below, you’ll see that I first track the time I ate. I’m really focusing on eating only when I’m truly physically hungry, so looking at what time I last ate helps me answer that question. Remember that physical hunger starts in the body, but emotional hunger starts in the mind. Next, I write down the food I ate. The Y/N column is simply to track whether I was hungry or not. The number indicates my hunger level on a 1-10 scale where 5 is neutral, 0 is starving, and 10 is stuffed. I try to stay between 3 and 7. The notes section is for anything I feel is important to remember about that meal or how it made me feel. The last column is my hunger level once I’m done eating. I try to stop eating when I’m just satisfied, but not overly full. Here’s another one I did on a full page because I felt it was taking up too much room on my daily pages. We can’t skip over meal planning because it’s an important part of being successful on your health and fitness journey. 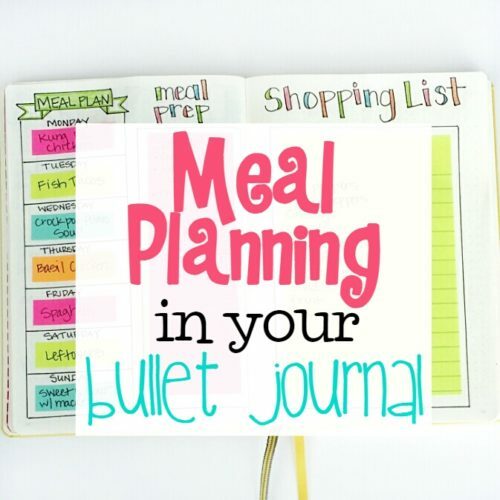 Rather than make this post any longer, I’ll simply link you to my post about how I meal plan in my bullet journal! 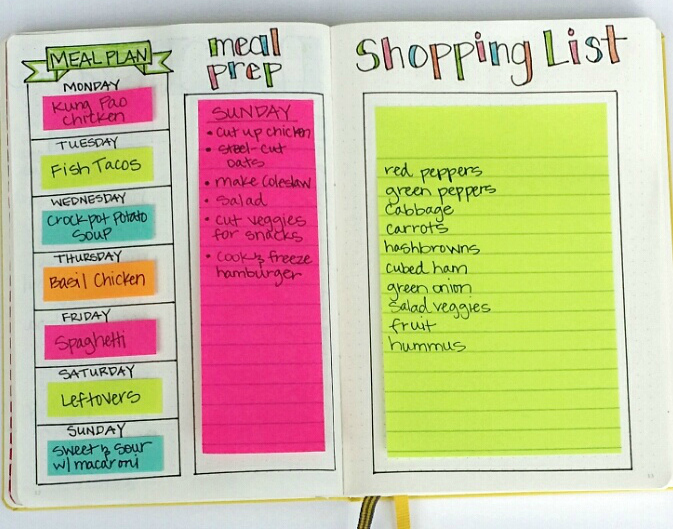 Click here to read more about my meal planning process and the tools I use! Let’s hear from you! How do you track your health and fitness in your bullet journal? Do you find it motivates you? 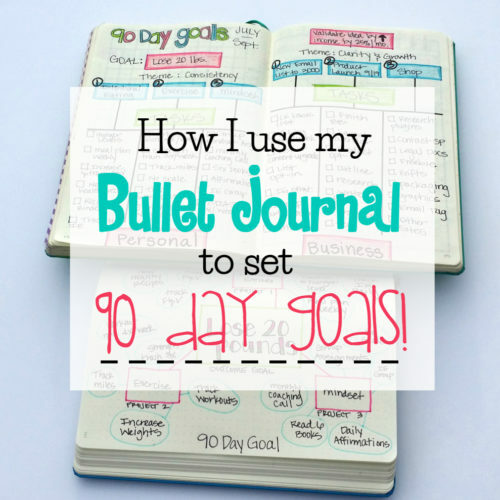 Share with me in the comments below and feel free to link to any of your Bullet Journal fitness spreads. I’d love to check them out. This is AMAZING. 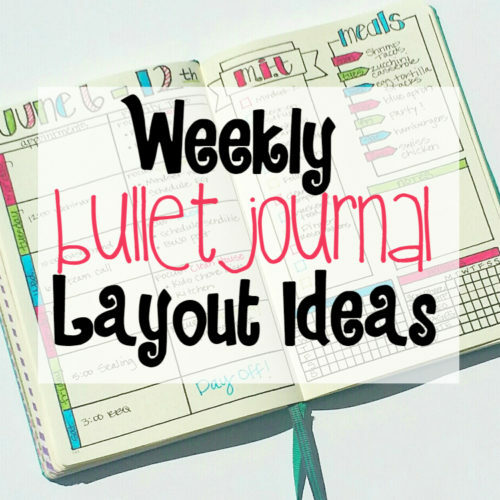 I have been looking for some ideas to incorporate my fitness into my bullet journal, and these are all great ideas! There are SO MANY ideas here, I have to bookmark this post! I think the most important part is not being afraid to experiment, like you suggested. At first I was too afraid to write anything because all of the bujos posted online are so perfect. WOW, these are exactly what I have been looking for Thank you!!!! This is what I’ve been looking for. So glad I found your site. This is genius! I especially like the reusable meal planner. What sizes of sticky notes did you use? Where did you find them? They are just standard post-it page flags. I got them at Walmart. Thanks for this post! 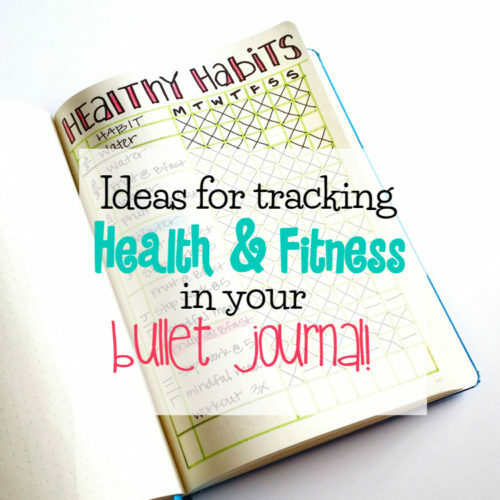 It contains such great ideas for tracking weight loss, fitness, food, etc. I’m wondering if you have any ideas on tracking chronic illnesses at all. I’ve searched Instagram and Facebook as well as Pinterest but haven’t found anything too helpful. Any ideas or suggestions you have would be greatly appreciated. Thanks again! I have a question. Do you have any idea where one could purchase the dot grid journals? I have been looking at different places as well as online and have not really found anything. I did find a few but the notebooks/journals were too small in size. Thanks for the mile tracker page! I am loving seeing how many miles I’m walking! Your whole website is amazing! 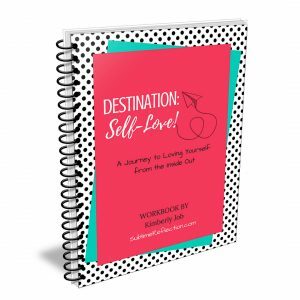 I have started my own blog recently and I was looking for fun and creative ways to plan my content/posts. Your website makes me want to do it for every aspect of my life! I sent you an email, Cassy. May I inquire what is at the bottom of your strength tracker? 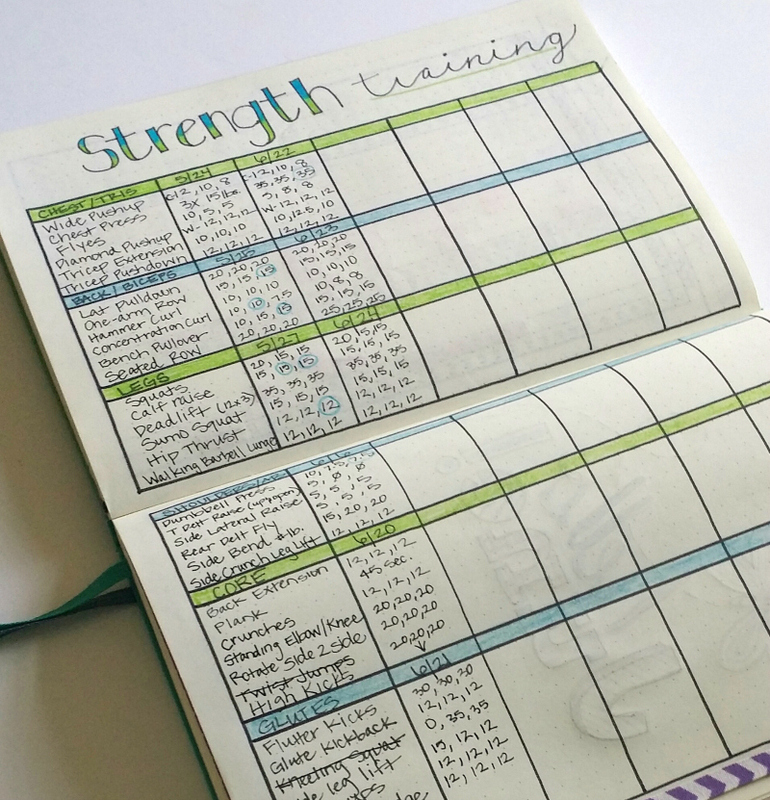 The corner was cut off in the picture, but I thought you had some great ideas there for strength training and journaling, so I was curious as to what the rest of that page detailed. Thanks so much! Fantastic ideas here!